About two weeks ago we decorated our place for Christmas. Brian wasn’t feeling up to par that day so he lay on the couch and gave suggestions while I put things up. 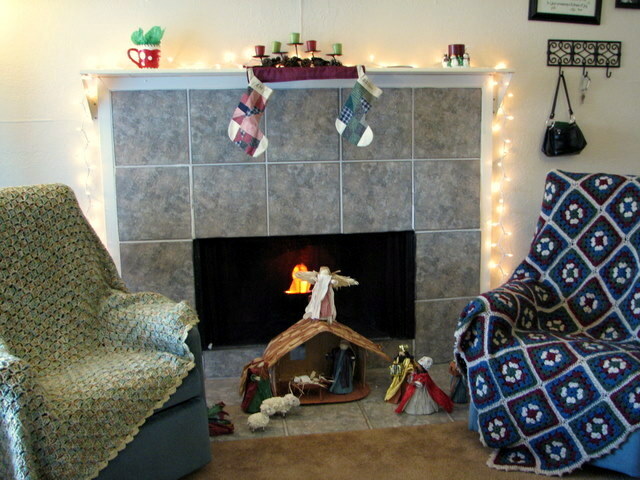 He did put the mantle above our fireplace – a very helpful addition for the look of things. 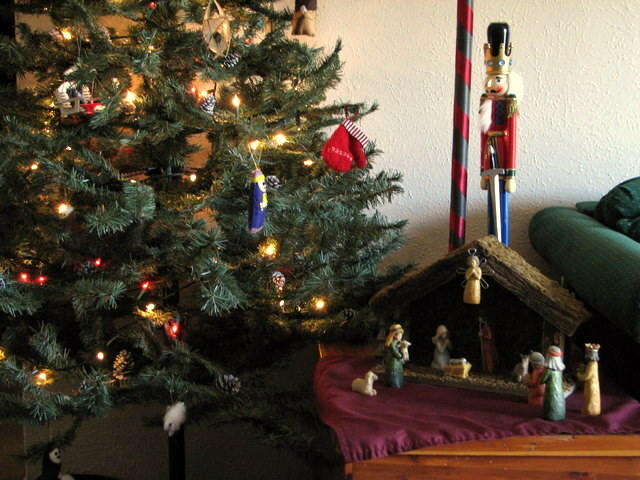 The manger scene is one we made last year when the girls from my family were visiting. Lance isn’t crawling yet so we can have stuff on the floor I do need to make Lance’s stocking though. Here’s our tree setup. A fake tree worked out perfect because by leaving a few branches off the back we could fit it into the corner. We also put up lights outside. I love having Christmas lights on – both inside and out. I try to have them turned on before Brian gets home because it’s so much cheerier to be greeted by lights on a cold, dark night. I also love seeing presents under the tree and our Christmas cards on the mantle – it just brings back good memories and feelings. 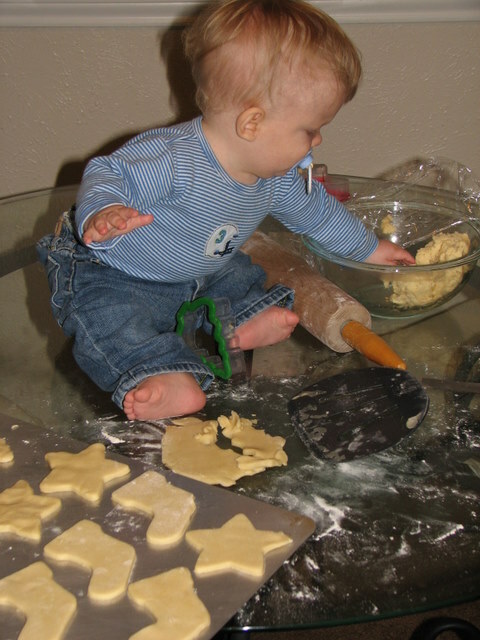 Now for a cup of cocoa…..
Lance has turned into a little elf and he and mommy scurry around doing little projects. Fortunately he’s too young to know that cookie dough tastes good (along with the pacifier for extra security). 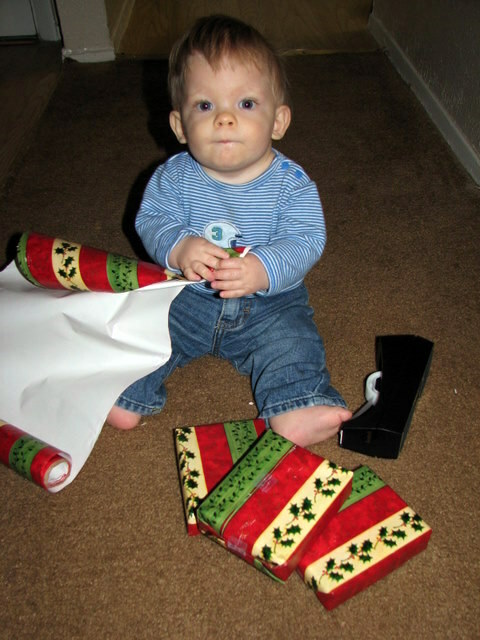 He’s very good at ripping paper so he should have fun on Christmas morning. Lance has come up with a few new games. Daddy taught him how to turn off light switches so now he helps me save energy as we leave a room. He makes such a cute giggle every time I hold him up to one. We played ball today; I rolled it to him and he would pick it up and hand it back – it was so cute! This afternoon I gave him a cracker to start his meal and since I was still holding him he decided to share with me. He would put it in his mouth then put it to mine – the connection tickled him very much. It’s neat to see him reach out and interact with us.